Buying healthy food can be expensive if you’re purchasing a lot of out-of-season, exotic or convenience items. However, if you have a list of inexpensive foods in mind when you do you’re meal planning, you should be able to stick to your budget while still eating healthy meals. I enjoy feeding my family mostly healthy whole food meals, while sticking to a budget. It’s not easy, but it’s possible. 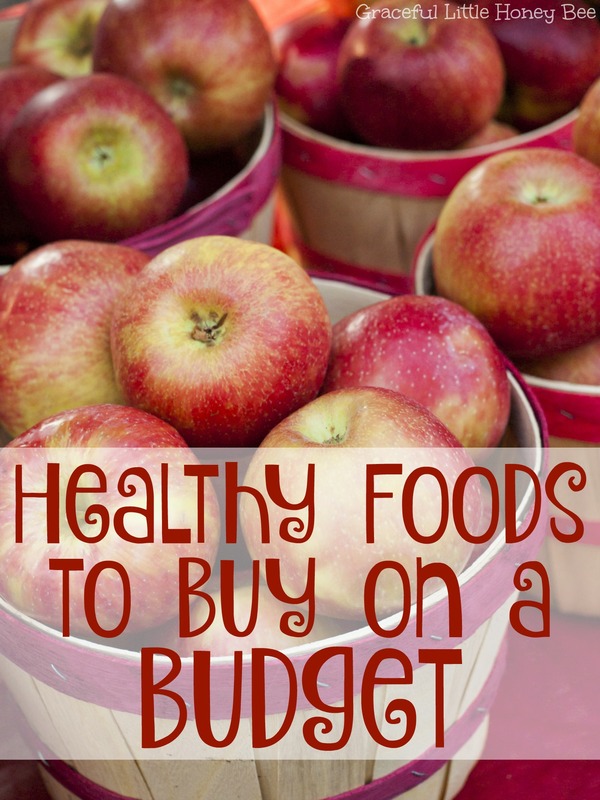 Today I’m going to share with you which foods you should be buying if you want to eat healthy on a budget. I’m basing this list on my own experience. Prices and availability of foods may vary by region. Some of the healthiest and inexpensive grains that I’ve found are oats, lentils, beans, brown rice and whole-wheat pasta. All of these can be added to soups, stews, salads or casseroles to make a filling and nutritious meal. Just remember to look for whole versions of these products such as dried beans and old-fashioned oats for the most nutrition and savings. Meat is one of the most expensive items at the grocery store, but if you focus on planning your meals around a few of the least inexpensive choices you will be able to save a ton of money. I’ve found canned tuna, eggs, peanut butter and chicken thighs to be the least expensive and most filling options. Herbs and spices are a great way to make your healthy food taste amazing without breaking the bank. Obviously, if you can grow your own fresh herbs that would be best, but dried seasonings also work well. Wal-Mart and Aldi both carry a line of seasonings for under a dollar each. Stocking up on these and then making your own seasoning mixes will not only be healthy, but also save you money. What’s your favorite frugal healthy food? I’d love to know! I agree! We have two apple trees, blueberry bushes and strawberry plants that we just put in last year and I can't wait to get fruit form them. It's definitely cheaper to grow your own, especially if you want to make applesauce or jam. I live where i have foodlion , a shopper value or walmart to shop. I find i do best by going to foodlion and use coupons for only items i use and sales. I look for closeouts and grab all i can afford and use of it if it is something i use or want to try. Lately, we have been eating the Mediterranean food plan so i focus on vegetables, fruit, healthy breads and little meat. Yogurt is a mainstay in my house. I look forwatd to reading your post.